To get in touch with us, please send an email to: corpcomm@torontopolice.on.ca, or call us at 416-808-7100. Above contact details should NOT be used to report emergencies. If you have an emergency, please dial 9-1-1. To report a crime please call 416-808-2222 or anonymously with Crime Stoppers at 416-222-TIPS (8477). If you need to change the text size on this site, please use your browser's zoom function. Constable Milton Ferguson loves dancing. 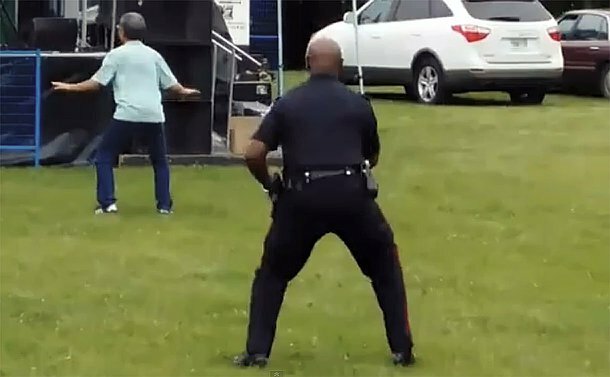 While staffing the Toronto Police Service’s Employment Unit booth at the recent Beaches Jazz Festival, he was inspired to burst a few moves. “The music was playing and I asked Sergeant Chris Gordon, who was with me, if I could go ahead and do some dancing,” Ferguson recalled. Little did Ferguson know the video would go viral with thousands of likes. “I was stunned to learn it became a YouTube sensation,” he said. Ferguson said he has always had a passion for dancing. “Once I hear music, I dance,” he added.